With over 60 years combined experience & having dealt with many clients of size and industry we have really been challenged with the thought that for some (indeed most) ‘Lean doesn’t work’. We are working with many clients whose first reaction was – ‘tried that, failed, couldn’t see the benefit’. Generally the approach seems that promise are made regarding the impact on an introduction to lean – ‘it will deliver X amount of savings for you’, ‘productivity will improve by Y%’. So often we see that, yes, there may have been an initial uplift but it has now lagged in terms of ongoing performance improvement and even soured most people in the organisation. As everyone agrees benefits of change are not instantaneous, performance does not improve overnight (and stay that way) or more importantly a consistent approach to improving performance on a daily basis cannot be achieved by a ‘one hit wonder’ intervention by outside experts. Our experience has shown that through any change or improvement programme only when change of behaviour becomes habitual you can only truly ‘bank your benefit’. The difficult question is how do we change behaviour to ensure that it becomes habitual? There are three major influences on our thinking, firstly the basics of Human Performance Technology – the ABC’s from Thomas Gilbert where Antecedents (the current situation that triggers the behaviour), lead to Behaviours which, in turn, lead to Consequences. Also the responsibility for performance lies at different levels in the organisation – at the workplace level where issues like culture and value must be stated & developed. At the level of ‘the work’ where the processes, standards, materials are in place to deliver the performance and lastly and most importantly at the worker level where the interaction of these levels results in the Key Behaviours that result in improved performance. Also, most interestingly that there is a systematic approach to making high performance habitual –the building blocks are placed & scrutinised in order. In other words the key behaviours that drive high performance are like a habit for the people performing the work. There is no point starting with outputs unless we have addressed the key inputs in terms of identifying the right values, the Key Behaviours, the enablers to sustain performance – in that order. As a result we now know that a primary reason for the failure of Lean implementations is the fact that Lean is an enabler of improvement but if the fundamentals of a high performing organisation are not in place it leads to piecemeal improvement (if any) and disillusionment in the business about the perceived benefits of lean. 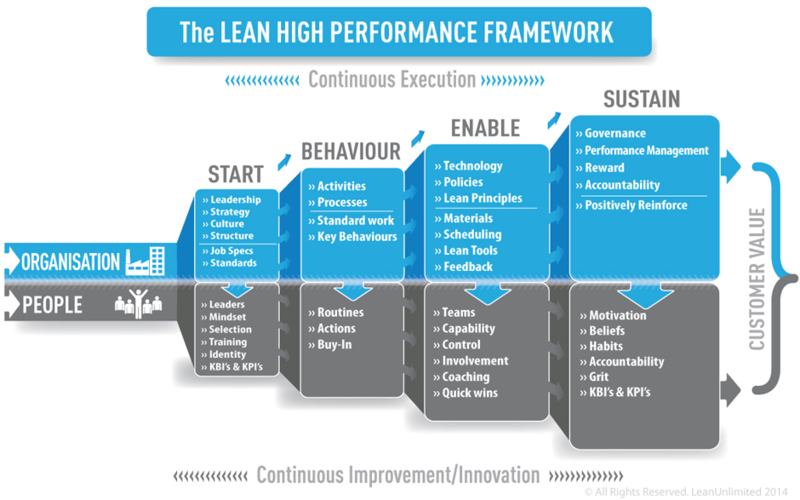 Each one of the blocks in the Lean High Performance Framework describe the fundamentals & the order & place in which they must occur.